It’s Getting Bright In Here! I remember talking with one of my good friends a while ago and we were trying to figure out why it is that we would sabotage ourselves from good things in our lives. Now it has come into my mind that it was because I thought it was me that would be shining and felt uncomfortable with that; like I would be putting people off by shining too bright. They might think that I think I am better than them. I now realize that it isn’t me that shines at all, it is God inside me that shines through. And I see how I let Him down if I hide His light. In fact it is my duty as a Christian to show the world His light and truth through my eyes, my heart and my mouth, allowing it to flow from my pores. I no longer hold back for He and His transforming power are my passion. I am a joyful, strong and wise woman who is passionate about Jesus and committed to serve His people by shining His light with every part of my life. A year ago we began a rebranding of our 21 year old optical business. We decided to share the “why we do what we do” in our business world at The Eye Man Optical, by proclaiming it and putting a name to it. We posted on our wall, Colossians 3:23 which states, “Serve wholeheartedly, as if you were serving the Lord, not people.” We make known our faith by the music we play as well as our integrity. I have committed to shining this beautiful light every waking moment of my life and am blessed and excited when an opportunity arises for me to do so in this dark world. You may think your light is small, but it can make a huge difference in other people’s lives. 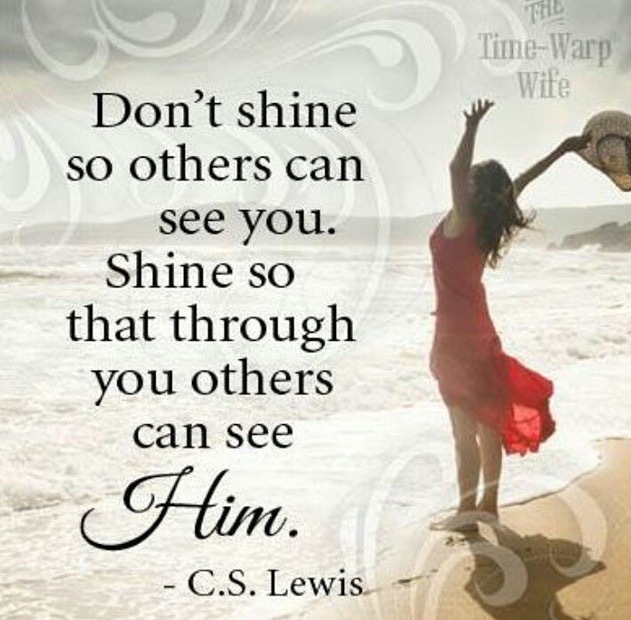 I challenge you to join me and SHINE! One Response to It’s Getting Bright In Here!